A Sung Holy Communion Service is held at 9.30am. on the 1st. Sunday of every month and a Holy Communion Service at 11.15 am on the third Sunday. There is also a Holy Communion Service held at 9.00 am on the first Wednesday of every month and occasional services at other times. Please check details on the Calendar. The Church is also used for Weddings, Baptisms & Funerals and at Christmas. The village sign, depicts a hare, a pheasant and a wheatsheaf, was designed as a competition entry and made in wrought iron by the village blacksmith, Chrlie Mountain. The village is 12 miles (19 km) north-east of King's Lynn and on the south side of the A148 King's Lynn to Cromer road. There is St Lawrence Church, and a primary school (which celebrated its centenary in 2008) and Ii has a Pub 'The Rose and Crown'. Nearby points of interest include Houghton Hall located north of the parish and the Peddars Way, accessible from the A148 just west of town. The Peddar’s Way is a Roman road, that runs locally through the cluster of Bronze Age barrows. The village is recorded in 1086 in the Domesday Book as having half a salt house and this may be important when we consider the derivation of the name. 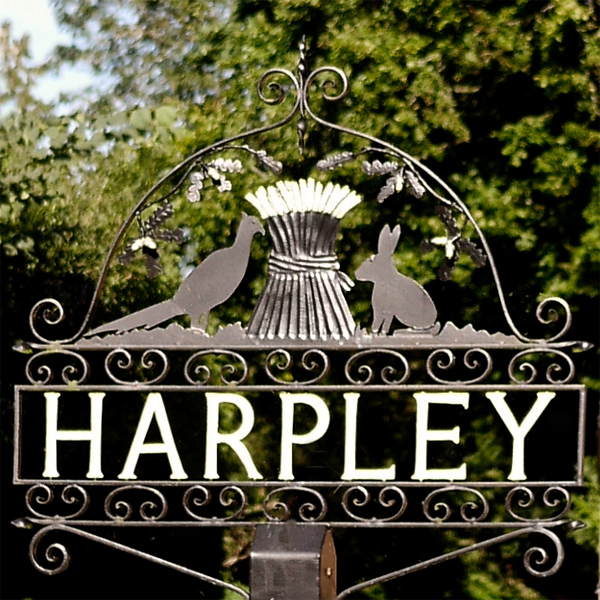 ‘Harpley’ comes from Old English and can be translated in a number of ways. One possible interpretation is ‘clearing with a salt harp’. A salt harp was a type of sieve used in the production of salt. Alternatively the name could mean ‘clearing of the harp’ or ‘harp-shaped clearing’. 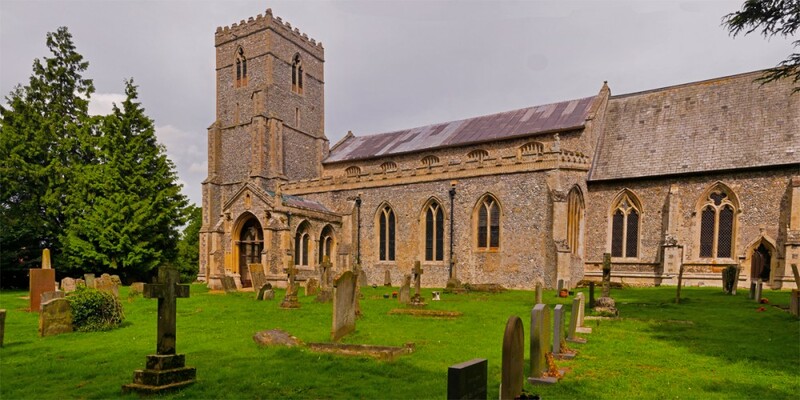 The Old English derivation of the name and the recording of the village in the Domesday Book suggest that Harpley was founded during the Saxon period. Archaeological evidence indicates that the parish was an important focus for a different type of activity much earlier in the Bronze Age. Sir Simon Jenkins wrote this of Harpley in his book of "England's Thousand Best Churches " -" A superb work of decorated Gothic craftmanship, with some splendid bench-ends carvings, depicting bears, monkeys, mythical beasts and bishops"
A bench end is carved with the name of John Martin, recording his gift to the Church in 1638. The bench ends include St Andrew with his saltire cross and St James as a pilgrim. 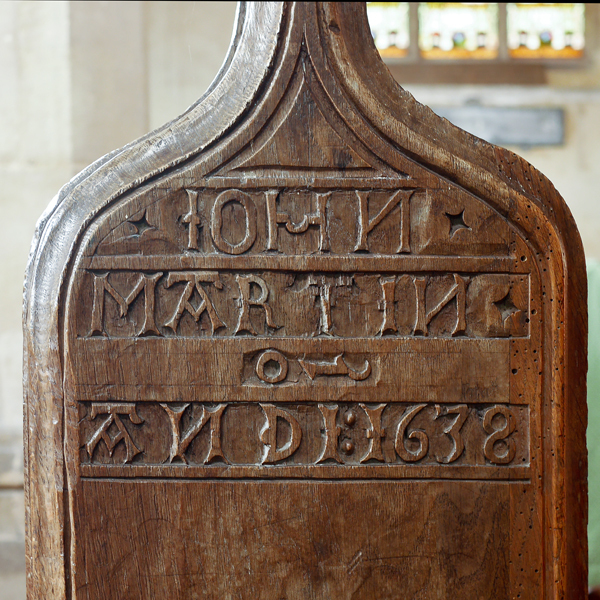 There are a couple of pages illustrating nearly all of the carvings - click here to see them.